"A Sketch of the Life of the Artist [Thomas Faed]," in "The Faed Gallery"
HOMAS FAED, the most eminent living artist of the school of which Wilkie is the representative, was born at Burley Mill, in the picturesque stewartry of Kirkcudbright, in Scotland, in the year 1826. His father, who was an able mechanician, though he had little opportunity of developing his talents in that direction, there carried on business as an engineer and millwright. The beauty of the scenery surrounding his home, and the interesting subjects for an artist with which the neighborhood abounded, soon caught the boy's attention. In the summer months, when the mill was idle, and there was no grain preparing in the kiln, he was in the habit of converting the smoke-begrimed apartment into a studio, where, like a second Rembrandt, with a fair top-light and a dark background, he painted diligently, using as models the ragged boys who lived in the rustic world around him. While still living in Edinburgh, Mr. Faed, in 1851, first became an exhibiter at the London Royal Academy, sending three pictures, Cottage Piety, The First Step, and My Father urged Me Sair, from "Auld Robin Gray." In 1852 he permanently took up his residence in London, and that year exhibited Burns and Highland Mary, and The Visit of the Patron and Patroness to the Village School. 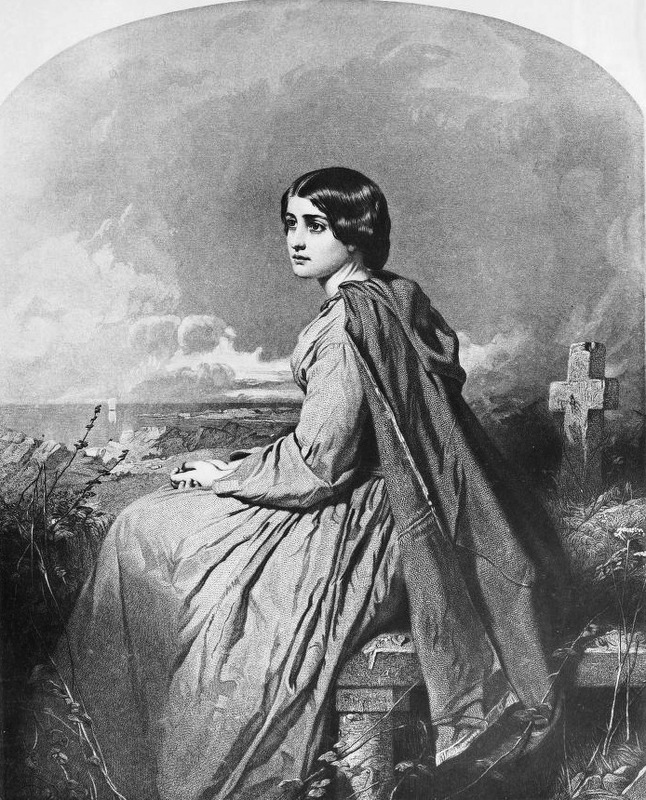 In 1853 he painted Evangeline, one of the best known and most popular of his works. This year there appeared at the Academy The Early Lesson, and Sophia and Olivia; the latter very graceful in composition, and painted with the nicest finish. In the following year he contributed to the Exhibition Morning, — Reapers Going Out, and Peggy, from Allan Ramsay's "Gentle Shepherd." In the year 1855 Mr. Faed achieved his first great success in the pic- ture of The Mitherless Bairn and from that year may be dated the ever-growing popularity which he has since enjoyed. It is said that this work ran a narrow risk of rejection by the hanging committee of the Royal Academy, and that it only obtained a low and unfavorable place, below the line, in consequence of the wise insistence of a single member. But the public showed a truer appreciation of his merits. It at once commanded the attention of the majority of the critics, who gave it a very high place among the "pictures of the season"; although Mr. Ruskin, in his "Art-Notes" of the year, declared that the work was "throughout the most commonplace 'Wilkieism,' — white spots everywhere." Mr. Faed also exhibited this year two less important works, Children Going to Market, and From Our Own Correspondent. In the year 1856 he painted for Lady Burdett-Coutts a pendant to The Mitherless Bairn, the almost equally admirable Home and the Homeless. Highland Mary was also in the Academy this year, and Conquered but not Subdued was exhibited in the Glasgow Art-Union. His only contribution in 1S57, The First Break in the Family, still further increased his fame. A listener ne'er hears gude o' himsel'. Sunday in the Backwoods was exhibited in 1859. The subject was suggested to the artist by the letter of an emigrant, giving an account of the new life and of himself and his family, and saying that the only drawback to their contentment with their lot was the illness of poor Jeanie. The scene is in the Canadian backwoods, and shows the emigrant household gathered in front of their log-cabin around the father, who is reading the Bible to them. There are eleven figures in the group, — one of them a girl sitting in an arm-chair, propped with pillows, and her fair face hectic with the deadly bloom of consumption. She is listening with a most touching look of sadness, yet of resignation, in her fever-bright eyes. The expressions of all the faces are admirable; but especially so is the grave, shrewd dignity of the pioneer father, and the fading beauty of the dying girl. It is a work of the rarest excellence of its kind, and is one of the most noteworthy productions of the artist. In 1860 was exhibited His Only Pair — a delightful bit of humor, representing a mother engaged in the interminable task of mending what looks like a hopelessly ragged pair of trousers, the youthful proprietor of which sits bare-legged and impatient on the table. In 1861 Mr. Faed was elected an Associate of the Royal Academy; and he, this year, exhibited his great work, From Dawn to Sunset. His contributions in 1862 were Kate Nickleby, A Flower from Paddy's Land" — both of them single figures, — and War News to an Old Soldier. With these the artist sent the only portrait he has ever exhibited, — an admirable one of the son of Mr. Hepworth Dixon. The next year he sent three pictures, — Train up a Child, The Irish Orange-Girl, and The Silken Gown; the latter illustrative of the Scottish song, "An' Ye shall walk in Silk Attire." 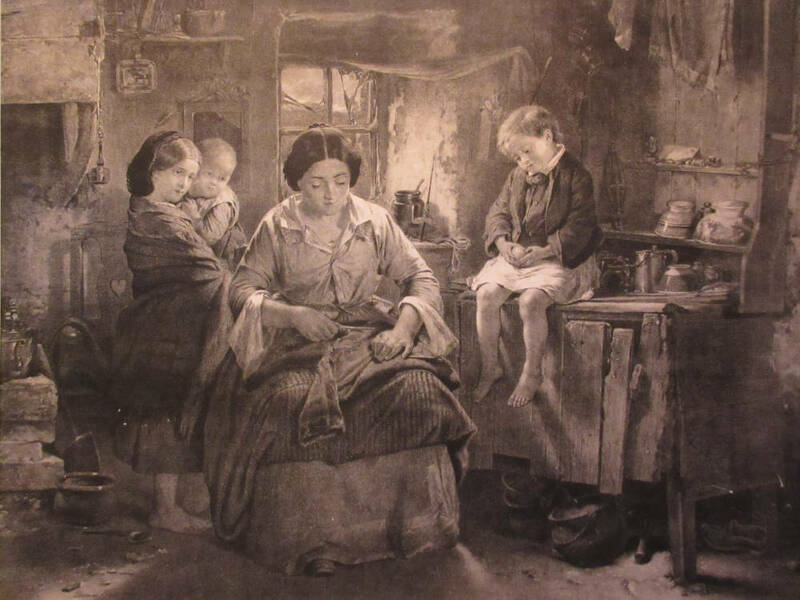 Baith Faither and Mither and Our Washing Day were exhibited in 1864; the latter work showing some buxom lassies chatting and laughing over their wash-tubs. This year Mr. Faed was elected a Royal Academician. He is also an honorary member of the Scottish Royal Academy. The Last o' the Clan was exhibited in 1865; and the next year appeared Pot-Luck and Ere Care Begins; the last-mentioned being his diploma-picture, — a work which all members of the Academy must present to the body on being elected one ot their number. Of this picture Mr. Palgrave said, in his review of the exhibition of the year, "Mr. Thomas Faed's simple mother and child is what 'diploma-work' should be, — a choice example of the artist's style. Nature surely comes closest to the heart when least adorned. There is a pathos in the pictures of the Scotch school, like that in the The Poor, the Poor Man's Friend was exhibited in 1867; and Worn Out, The Flower o' Dunblane and The Cradle in 1868. The year following he sent five pictures, — the largest number he has ever exhibited at one time, — Faults on Both Sides, Homeless, Letting the Cows into the Corn, Donald M'Tavish, [3/4] and Only Herself, — all homely subjects, treated with consummate art and the truest pathos. The last-named picture — one of the most touching of the artist's works — shows a lonely old woman, with a heavily-laden basket, resting at the foot of a rude stile. Her worn face and resigned action tell their own story as completely as a volume might. In 1870 appeared When the Day is Gone and The Highland Mother, and in 1871 A Wee Bit Fractious. The next year was exhibited God's Acre, and in 1873 Happy as the Day is Long, A Lowland Lassie, and A Skye Lassie. Three works were in the exhibition of 1874, — Violets and Primroses, The Sailor's Wife, and Forgiven; the last, perhaps, the greatest of Mr. Faed's recent pictures. He did not appear amongst the exhibiters in 1875; but the next year he contributed Morning and She Never told Her Love; and in 1877 Little Cold Tooties, A Runaway Horse and In Time of War. These later pictures, like the artist's earlier works, have as their subjects domestic incidents in rustic and humble life, and show the same vigorous execution, harmonious coloring, masterly delineation of character, and unaffected pathos.